An outline depicting an early Jurassic rift valley in New York with appropriate plants and animals. Pencil, photocopy and inkjet component collage, 20.375 x 21.5, 2002. 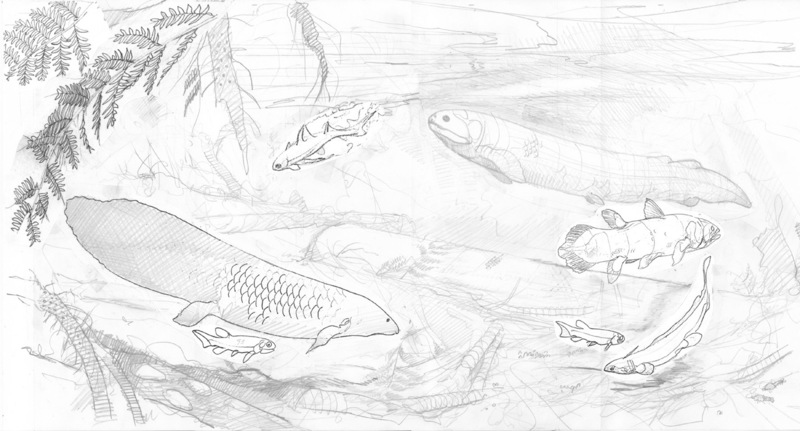 Illustration outline for a freshwater aquatic environment in the Carboniferous of Nova Scotia. Pencil and photocopy component collage on bond paper, 14.25 x 27 inches, 2007. Commissioned for use in the Joggins Fossil Centre. A Carboniferous aquatic freshwater environment associated with the Joggins Fossil Cliffs of Nova Scotia. The image depicts a large lungfish swimming among forest debris composed of Sigillaria roots and limbs, a tree fern trunk, seed fern and Cordates leaves and various horsetails stems. 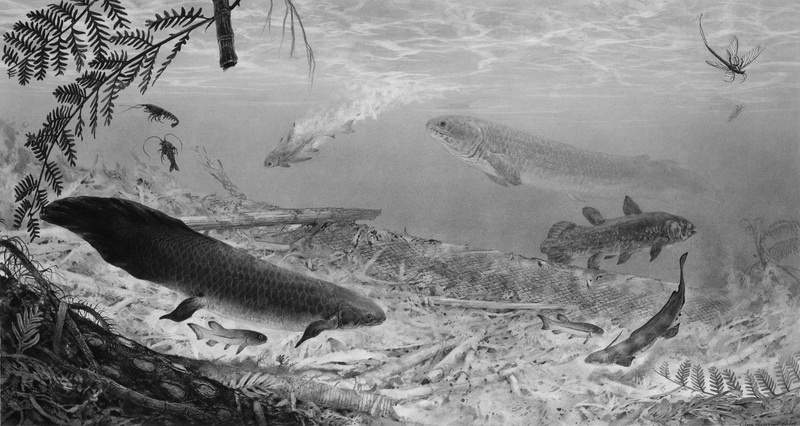 The small bottom fish is Haplolepis together with the freshwater shark Xenacanthus. A freshwater Coelocanth swims just beyond a large, fallen lepidodendron tree trunk. A somewhat hypothetical Acanthodian fish only know by large fin spines breaks the pond surface as it evades a large Rhizodontiform-like predatory fish. Pencil and graphite dust on 2-ply bristol paper, 14.25 x 27 inches, 2007. Commissioned for use by the Joggins Fossil Centre. 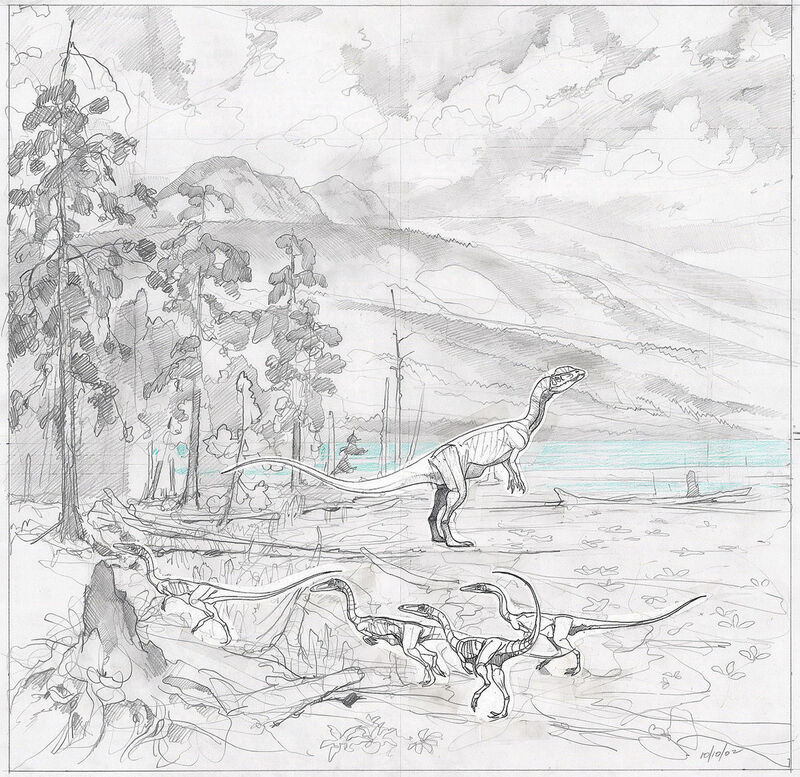 An outline depicting the approach of an asteroid above an Albertosaur stalking a group of Lambeosaurs. Pencil, photocopy and inkjet component collage, 20.375 x 22.25 inches, 2004. 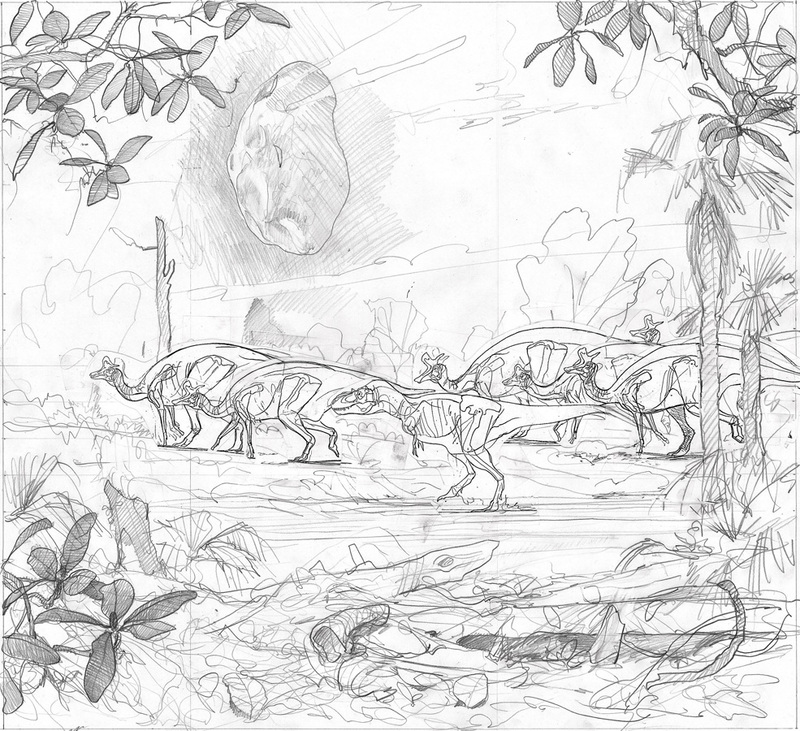 Outline design #1 for a commission of a group of Diplodocus and Allosaurs in Jurassic Colorado. 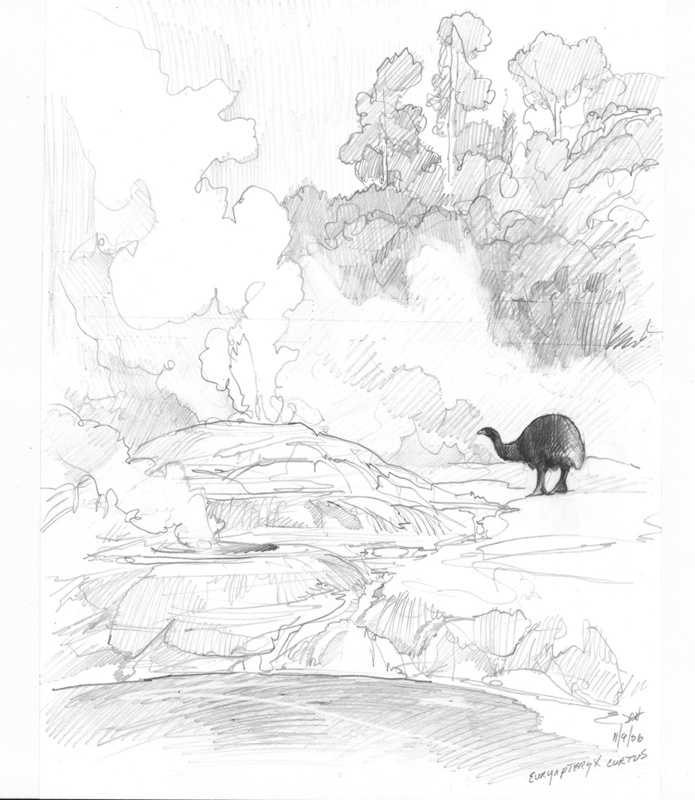 Outline design #2 for a commission of a group of Diplodocus and Allosaurs in Jurassic Colorado. 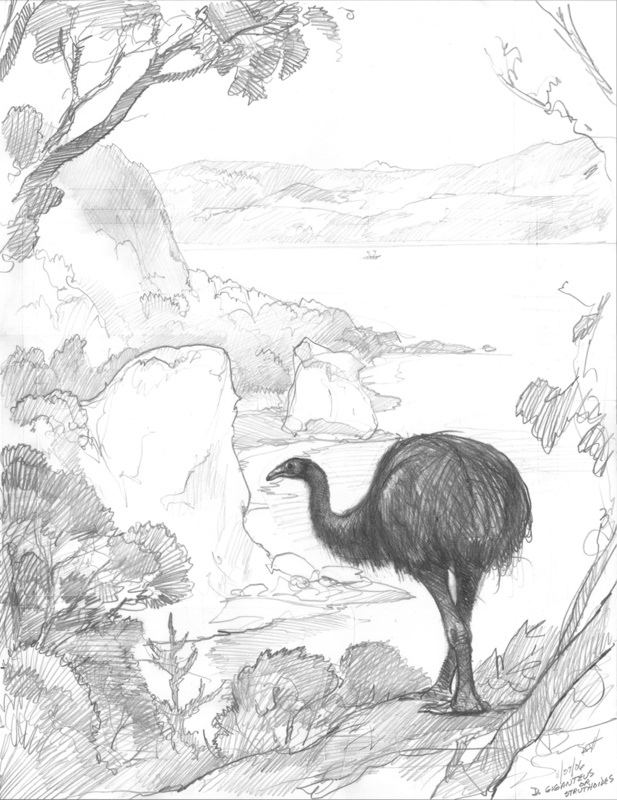 Illustration outline for a defunct book depicting New Zealand's largest Moa species, Diornis giganteus, witnessing the first arrival of the Moari, perhaps during the 1400's. Pencil and inkjet componet collage, 13.125 x 17 inches, 2006. 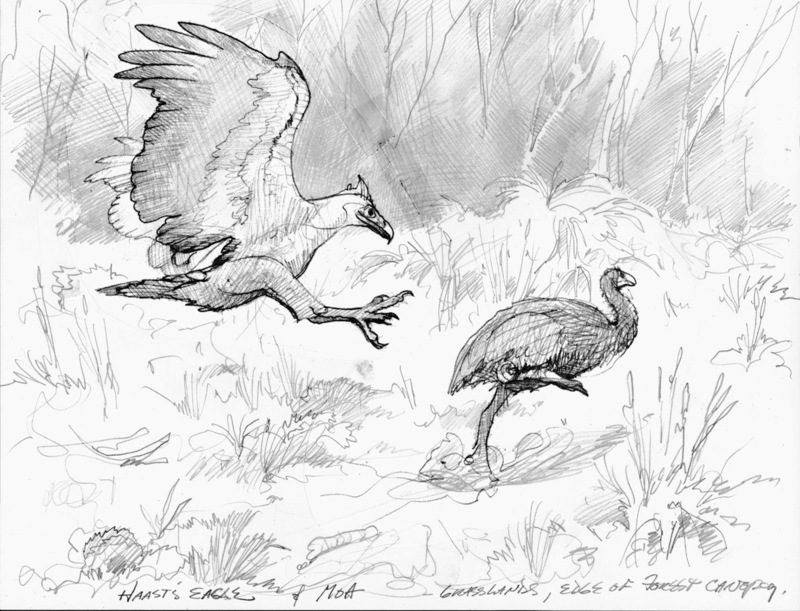 Illustration outline for a defunct book of a large, now extinct, Haast Eagle preying on a small moa. 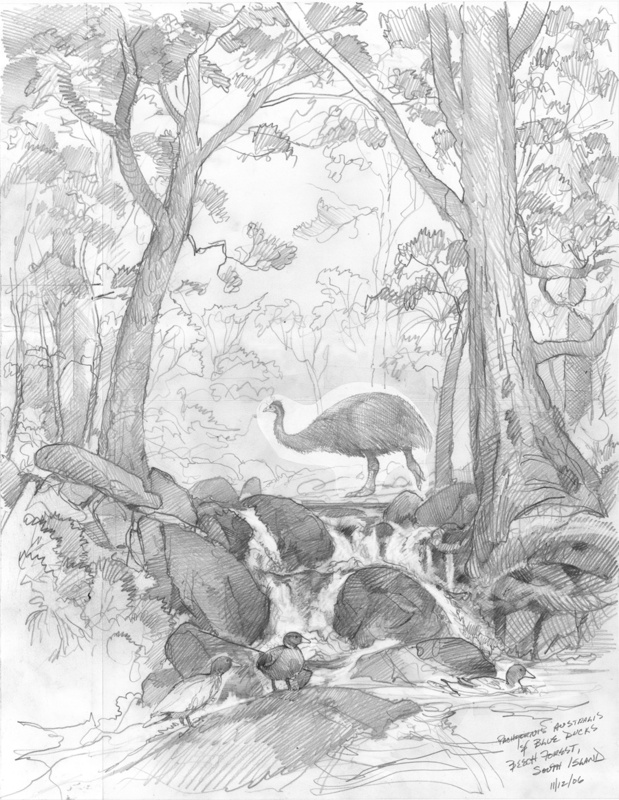 A large moa, Pachyornis australis, strides through a South Island beech forest above plunging rapids and gathering of Blue Ducks. Pencil, photocopy and inkjet component collage on bond paper, 13.125 x 17, 2006. 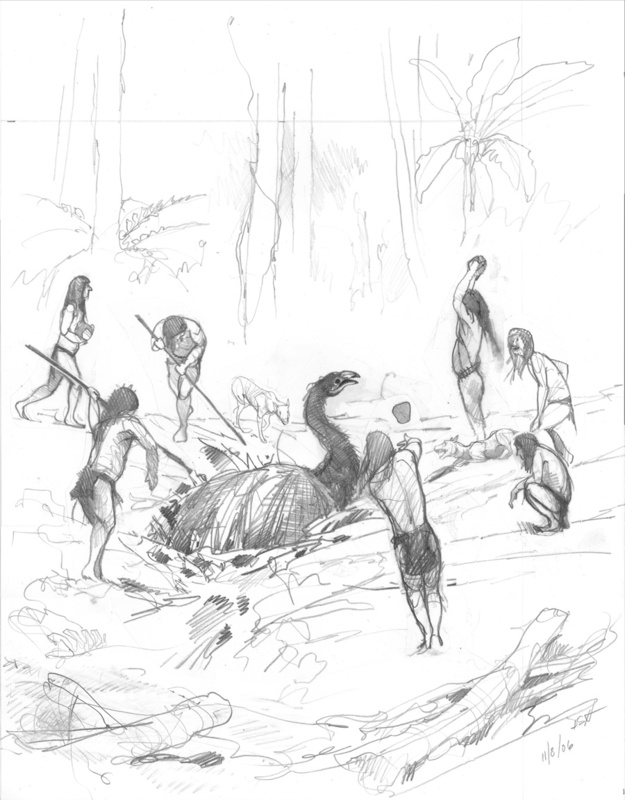 A group of Moari kill a large moa fallen into a pit trap. 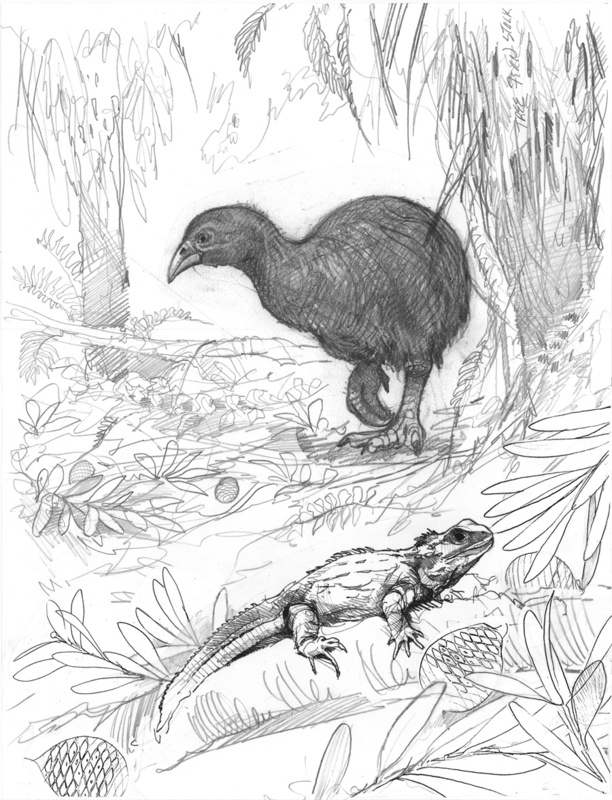 Illustration outline of the small moa Euryapteryx curtus passing some North Island thermal features. Pencil and inkjet componet collage on bond paper, 11 x 14.2 inches, 2006. 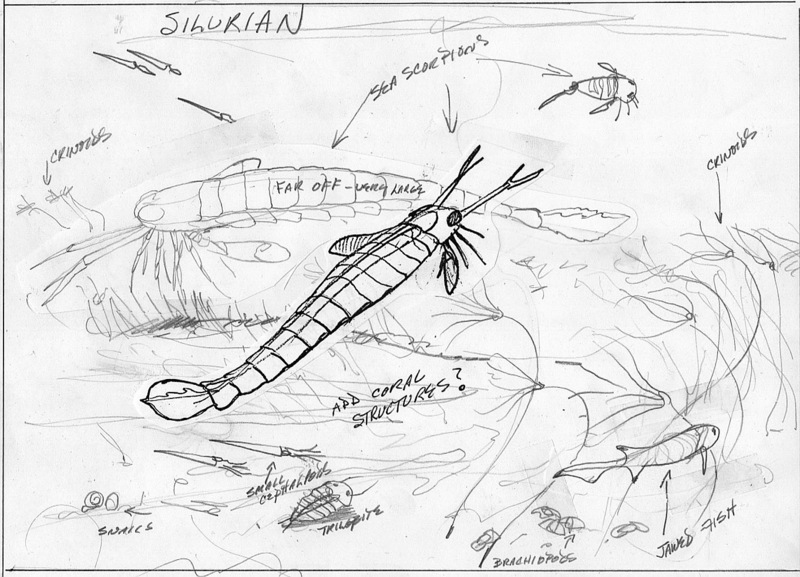 Outline design of a Silurian seafloor in New York showing suggested creatures to be included in a finished work. Pencil and photocopy componet collage on bond paper, 13.5 x 19.5 inches, 2003. Refined and finished outlines for illustrations done and left undone.